DVI-D Dual-Link connection cable for the transmission of digital high definition video signals. 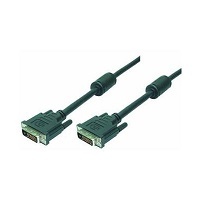 The DVI cable is suitable especially for a connection between a video card with DVI digital output and a monitor with DVI digital input and supports the dual-link function. The cable is sturdy, durable, high-quality workmanship. By shielding it is protected against electromagnetic interference.